A DataTemplateSelector can be used to choose a DataTemplate at runtime based on the value of a data-bound property. This enables multiple DataTemplates to be applied to the same type of object, to customize the appearance of particular objects. This article demonstrates how to create and consume a DataTemplateSelector. A data template selector enables scenarios such as a ListView binding to a collection of objects, where the appearance of each object in the ListView can be chosen at runtime by the data template selector returning a particular DataTemplate. The OnSelectTemplate method returns the appropriate template based on the value of the DateOfBirth property. The template to return is the value of the ValidTemplate property or the InvalidTemplate property, which are set when consuming the PersonDataTemplateSelector. 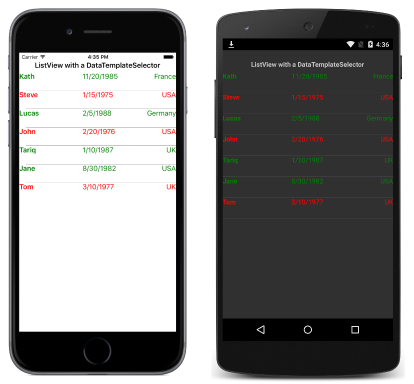 An instance of the data template selector class can then be assigned to Xamarin.Forms control properties such as ListView.ItemTemplate. For a list of valid properties, see Creating a DataTemplate. The DataTemplateSelector subclass must always return the same template for the same data if queried multiple times. The DataTemplateSelector subclass must not return another DataTemplateSelector subclass. The DataTemplateSelector subclass must not return new instances of a DataTemplate on each call. Instead, the same instance must be returned. Failure to do so will create a memory leak and will disable virtualization. On Android, there can be no more than 20 different data templates per ListView. This page level ResourceDictionary defines two DataTemplate instances and a PersonDataTemplateSelector instance. The PersonDataTemplateSelector instance sets its ValidTemplate and InvalidTemplate properties to the appropriate DataTemplate instances by using the StaticResource markup extension. Note that while the resources are defined in the page's ResourceDictionary, they could also be defined at the control level or application level. At runtime, the ListView calls the PersonDataTemplateSelector.OnSelectTemplate method for each of the items in the underlying collection, with the call passing the data object as the item parameter. The DataTemplate that is returned by the method is then applied to that object. Any Person object that has a DateOfBirth property value greater than or equal to 1980 is displayed in green, with the remaining objects being displayed in red. The PersonDataTemplateSelector instance sets its ValidTemplate and InvalidTemplate properties to the appropriate DataTemplate instances created by the SetupDataTemplates method. At runtime, the ListView calls the PersonDataTemplateSelector.OnSelectTemplate method for each of the items in the underlying collection, with the call passing the data object as the item parameter. The DataTemplate that is returned by the method is then applied to that object. This article has demonstrated how to create and consume a DataTemplateSelector. A DataTemplateSelector can be used to choose a DataTemplate at runtime based on the value of a data-bound property. This enables multiple DataTemplate instances to be applied to the same type of object, to customize the appearance of particular objects.